Iran called on Monday for militants to be "cleaned out" of Syria's Idlib province, as it prepared for talks with Syria and Russia about confronting the last major enclave held by rebels opposed to President Bashar al-Assad. Syrian government forces are planning a phased offensive in Idlib and surrounding areas held by insurgents fighting Assad, who has been backed by both Russian and Iranian forces in the country's conflict. U.S. Secretary of State Mike Pompeo has said Washington views any government assault on Idlib as an escalation of Syria's war, and the State Department warned that Washington would respond to any chemical attack by Damascus. 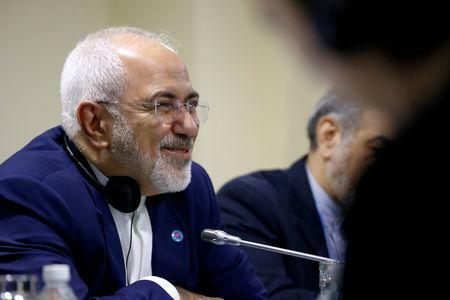 Zarif met Assad, Syrian Prime Minister Imad Khamis and Syrian Foreign Minister Walid al-Muallem, who asked for Iran to continue its support, according to Iran's Fars News. "All of Syrian territory must be preserved and all the sects and groups should start the round of reconstruction as one collective and the displaced should return to their families," Zarif said, according to Fars News. "And the remaining terrorists in the remaining parts of Idlib must be cleaned out and the region should be placed back under the control of the Syrian people." Assad's office said in a statement: "The two sides asserted that the pressures from some Western states on Syria and Tehran will not deter the two countries from continuing to defend their principles." Last week, Iran's defense minister traveled to Damascus and signed an agreement for defense cooperation between the two countries with his Syrian counterpart. Iranian foreign ministry spokesman Bahram Qassemi said Iran would continue its support for Syrian government forces in its battle in Idlib.